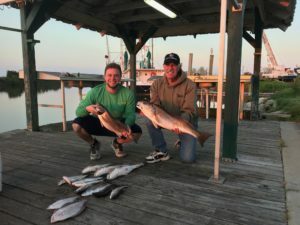 Kenneth caught these nice Reds and more to blacken for dinner! 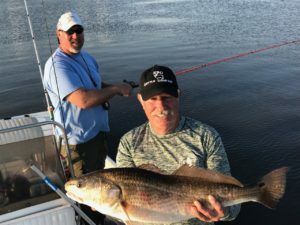 Ray had a great time limiting on Redfish and catching some big ones for his birthday. The most popular and my favorite way to cook Redfish is Blackened. To blacken Redfish is quick, simple and tastes so good. Directions – Cooking this is best done outside, due to smoke. Heat a cast iron skillet to HOT. Melt butter. Dip or coat each filet in butter. then coat each filet with blackening seasoning. Then place filets in the HOT skillet cooking about 2-3 minutes on each side, depending on the size of your filets. Serve hot and enjoy! 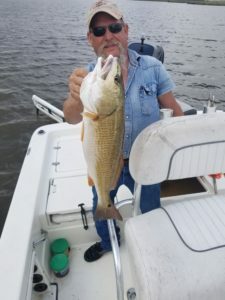 Randy had a great time wrestling with this 32 inch monster Redfish. A late afternoon trip paid off for Doug and Mitchell. 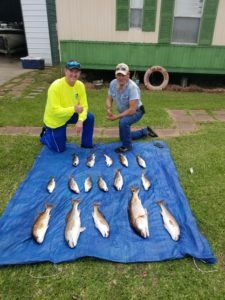 There is more to catch in Louisiana than just fish. 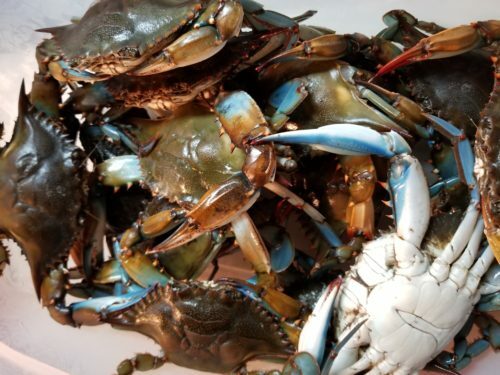 My son and I had a great time catching these Blue Crab and an even better time having them for dinner.